Go Metro and take the Dodger Stadium Express to the World Series! 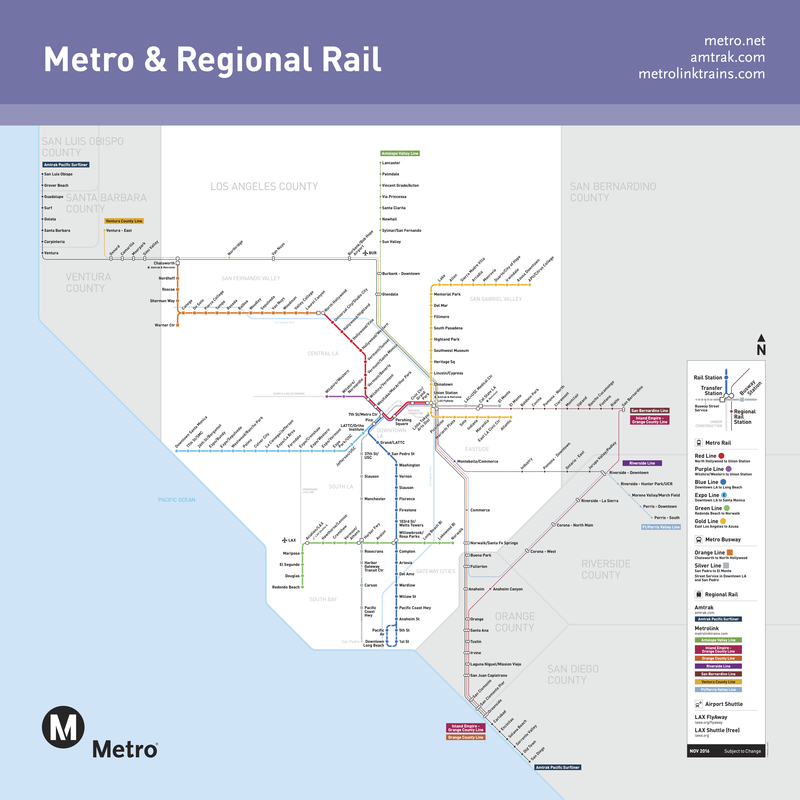 The Metro Rail system along with Metrolink commuter rail service and Amtrak. Click to see larger. The 2017 World Series, after five heart-stopping and improbable games, will likely go down in the history books as one of the best ever. We literally can’t even imagine what’s in store for Game 6 (other than the outcome: an Astros loss) and Game 7. Metro’s Dodger Stadium Express will be providing free service to game ticket holders to all World Series games from both Union Station and the Harbor Gateway Transit Center in the South Bay. Crowds and traffic will be huge for both games. Tuesday, of course, is also Halloween — traditionally a big ridership night for Metro. So there should be plenty of traffic on local streets. Due to huge crowds for the game and L.A. traffic, we encourage everyone to arrive early! Also, this: the Union Station garage is expected to fill for both games. The last spaces were gobbled up about 3 p.m. for last week’s games and will likely go even earlier for Games 6 and 7. Either arrive at Union Station early in the day or consider taking transit to Union Station, with the Gold Line and the Red/Purple Line subway being good options. Board near on the Alameda Street side of Union Station — if coming from inside the station, go through the front door and turn left. Service leaves Union Station every 10 minutes, starting three hours before game time through the third inning for all home games. You can exit inside Dodger Stadium at one of two stops – behind Center Field and at the Top Deck. Service will pick up at the same stops after the game. Please be in line for a bus within 45 minutes of the game ending. Union Station is the primary transit hub for the region and is served by the Metro Red/Purple Line subway, the Metro Gold Line, the Silver Line, numerous Metro Bus lines, Amtrak and Metrolink. Please click here for Metro maps and timetables of every rail and bus line. You can also use Trip Planner or Google Transit to find routes and connections. Parking is available at Union Station for $8. There are signs throughout Union Station pointing the way to the Dodger Stadium Express. We also suspect there will be a lot of people next Tuesday wearing blue jerseys and walking in the same direction. 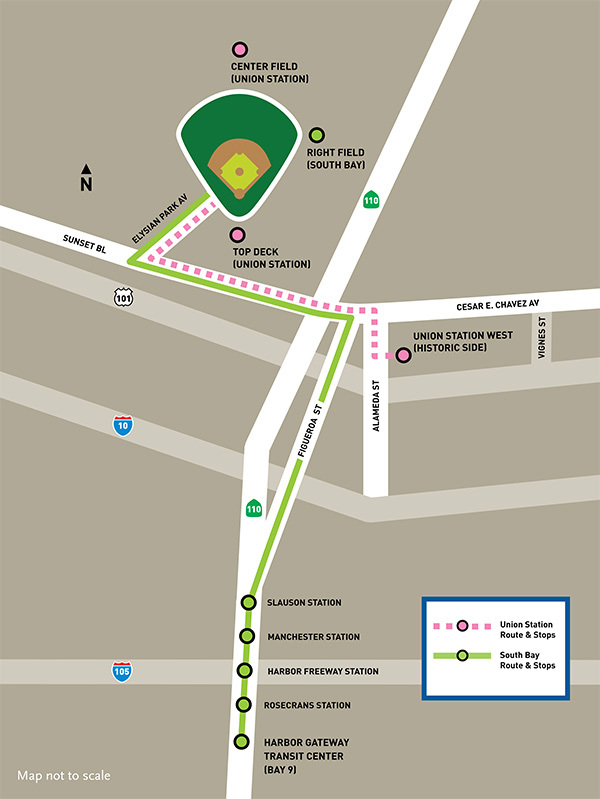 Board the Dodger Stadium Express at any of the following stations along the 110 freeway: Slauson, Manchester, Harbor Freeway, Rosecrans or Harbor Gateway Transit Center (Bay 9). Buses run every 20 minutes starting two hours before game time, with the last bus leaving Harbor Gateway Transit Center at game time. You’ll be dropped off behind Right Field. Service back to the South Bay will pick up at the same stop after the game. Return service begins after the end of the seventh inning. Please be in line for a bus within 45 minutes of the game ending. Harbor Gateway Transit Center is also served by several Metro bus lines, the Metro Silver Line and Torrance Transit. Free parking is available although may be limited if the lot fills. As we mentioned above, rides on the Dodger Stadium Express are free to those holding game tickets. Regular Metro fares apply on all other connecting bus and rail service — the regular adult fare is $1.75 with a TAP card, which are available from TAP vending machines at all Metro Rail and Orange Line stations and at Harbor Gateway and El Monte Station (how to pay fare is here). And if you’re driving to downtown L.A.: Beat traffic on the 10 and 110 freeways with Metro ExpressLanes. They’re toll-free for carpools, vanpools and motorcycles; solo drivers can use them too, by paying a toll. All users except motorcycles need a Fastrak® transponder. Learn more at metroexpresslanes.net . And finally this fun fact: since moving to L.A., the Dodgers have appeared in the World Series in 1959 (win), ’63 (win), ’65 (win), ’66, ’74, ’77, ’78, ’81 (win) and ’88 (win) but only clinched a Series victory once at home and that was in 1963 in the second season playing at Dodger Stadium. Dodger Stadium Express service is provided to all home games under a grant from the Mobile Source Air Pollution Reduction Review Committee (MSRC). The MSRC awards funding within the South Coast Air Basin from a portion of the state vehicle registration fee set aside for mobile source projects that result in emission reductions from cars and trucks. Funding for the Harbor Gateway Transit Center service is being provided by Metro’s ExpressLanes Net Toll Reinvestment Grant Program. Is there any good reason the Silver Line’s LATTC/Ortho Station or even 37th St./USC Station was skipped. It would have given a good connection to the Expo Line for that service. Just make sure that maintenance is curtailed during this time. 20 minute service on each branch of the subway is bad enough but cancelling Purple Line service leads to increased congestion in the downtown area at night. Why is it such a secret when the trains stop tonight? You would think with the World Series tonight and it being Halloween, the Metro trains would be running late, right? I’m betting it’s not. Nice work on that! Trains tonight run until their normal closing times for a Tuesday night.